1. 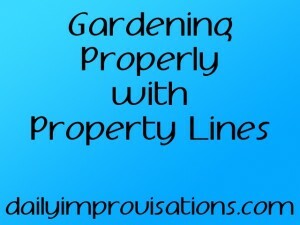 Property lines mean a mingling of plants. Grass encroaches, vines overhang, and seeds and weeds pass it on. By choosing well on your side of the property line, you can save yourself trouble. Consider pathways that are easily monitored for weeds or deep borders guards to keep roots from expanding. Honestly, I have never found an in-ground barrier that works well if a fence is also involved along the property line, since it interferes with placing the barrier effectively. I have had the ironic problem of vigorous plants that I have cultivated then self-sowing in a neighbor’s yard, but they like the flowers or herbs more than I did, then I am left fighting them along the border for years. Sometimes, you inherit landscaping growing on both sides of a property line, such as our huge 60 year old willow tree. This makes it difficult to put in a fence after the fact. This border is currently being uniquely dealt with, since the pavers are still well within our property line and the fence is even inside of those, having been put up quickly due to an immediate need and never changed. Plus, we have a particularly good relationship with these neighbors. Still, one day in the near future, I hope to have this property line more permanently adjusted. 2. 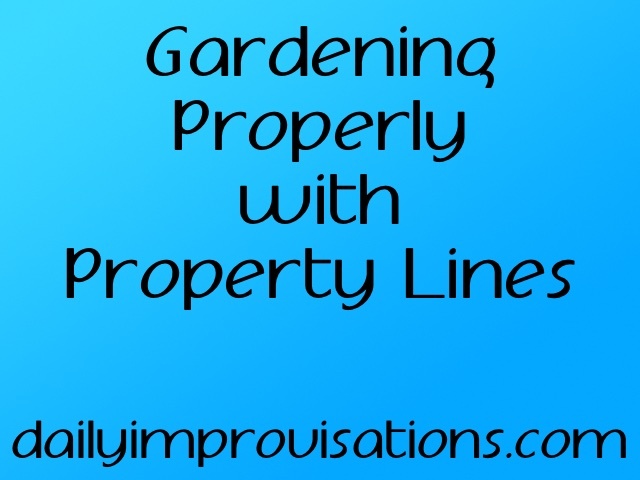 Property lines mean limited access to garden beds. Unless you have open grass up against open grass, you will need to get in to an area to weed, prune, or harvest. For a garden bed wider than 2 feet, you will have to walk on it to tend it. Even with that, it can be hard to see everything well when you only have a view from once side. More and more I am convinced that all garden beds should be at least a couple of feet away from a property line. 3. Property lines mean possible conflict of interest. Even if you have the nicest neighbors possible, it is likely that they have something going on along the border that is competing with what you have going on. Whether it be a driveway full of cars or a prize flower bed, they may be spraying weed killers, cutting away overhang from your plants, or digging roots that are destroying their asphalt. It can work against you when you are trying to be careful of the other person’s property, too. My landscape architect son speaks of pruning trees for clients that overhang a fence. He has developed ninja pruning skills wherein he can hold the long-handled pruners with two hand, make the cut, then immediately let go with one hand and catch the branch. Most of the time. The only way to be sure to avoid these problems is to keep important or large plants away from the property lines. The raspberries in the neighbor’s yard have been some trouble in the past, but there are always some to pick on our side of the fence, too, much to one daughter’s delight! 4. Property lines mean trouble with watering. There will almost always be uncontrolled watering occurring along shared borders. With wind, efforts to make sure plants right along the border are watered, slopes, or just different watering needs of the plants in each yard, it will be very difficult to efficiently manage water usage along borders. Again, the best solution for this is to not have plants along the border that are sensitive to watering variations or not grow anything along the border at all. This property line involves our road-like workshop area and their grass. Understandably, they try to water the edges of their grass and we get quite a few weeds along the border, but since nothing else is there, it is still relatively easy to deal with. 5. Property lines mean differences of opinion about the view. Someone is always seeing something they’d rather not. And other people wish they weren’t looking at it. Fences help some, but common neighborhood yards still share a significant number of visually open borders, not to mention views from the second story. If property line borders are designed for easy maintenance, they may look better. This may make for happier neighbors and less stress for you. 6. Property lines frequently create challenging edges. Where cement or asphalt are involved, the garden beds can be subject to much greater heat and/or less available water. Sometimes there is an issue with foot traffic or parking that puts any plantings at risk. A buffer zone and a physically unavoidable edge can help a lot in these places. 7. 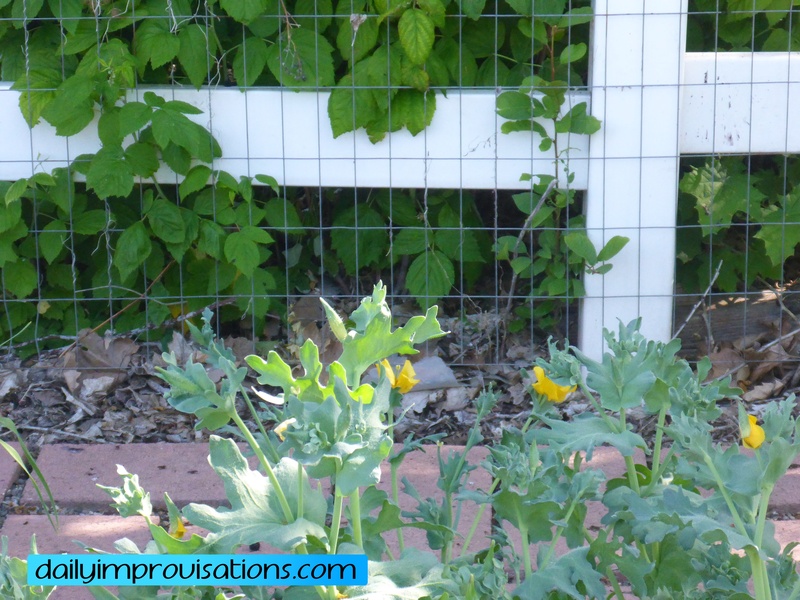 Property lines often mean fences. Fences not only create their own micro-environments of shade, but they usually harder to mow or weed along. Any kind of fence that resembles a trellis will be easily infested with bind weed. Solid fences direct wind in ways that collect debris, random trash, as well as leaves that pile up and smother gardens. Even fences that are open to air flow catch things you think should blow through them. Fence lines also tend to be where the family dog keeps guard. Think hard before planing anything important along a fence. The chicken tunnel along this back border has made my life easier. And the chickens are fun to watch in it, too. Grass to grass can be a good option for common borders, but it won’t work all around the property. Sidewalks, whether cement or asphalt have some appeal, but are relatively expensive. Individual pavers set in something like pea gravel can be a useful compromise. Gravel or mulch only borders are lower cost, but generally require more weed control. These will be most effective where water can also be controlled. Chicken tunnels work well for me along one back border where grass was invading. A dog path/run sounds interesting for some places, but an owner might have to be concerned about making lower edges of fences particularly dig-proof. The optimum solution for your property lines and borders will depend on your particular variables. Sometimes what appears to be the most expensive or labor intensive choice will save you lots of money and time in the future. Don’t be afraid to break out of the standard mold or look past magazine photos to design yourself borders that are the right combination of beautiful and frustration-free.